A selfless Cardiff woman who continued supporting brain injury survivors after her own breast cancer and arthritis diagnoses has been shortlisted for a national award. Sally Palmer, has been volunteering at Headway Cardiff and South East Wales for more than 20 years and has helped to raise over £150,000. Her incredible achievements have seen her named as one of three finalists for Headway – the brain injury association’s Volunteer of the Year Award, sponsored by Anthony Gold Solicitors. “I love everything about volunteering for Headway,” said Sally. “When I tell people I work with brain injury survivors they say ‘isn’t that depressing?’ Well no, it’s actually really heart-warming. We’re like a big family. 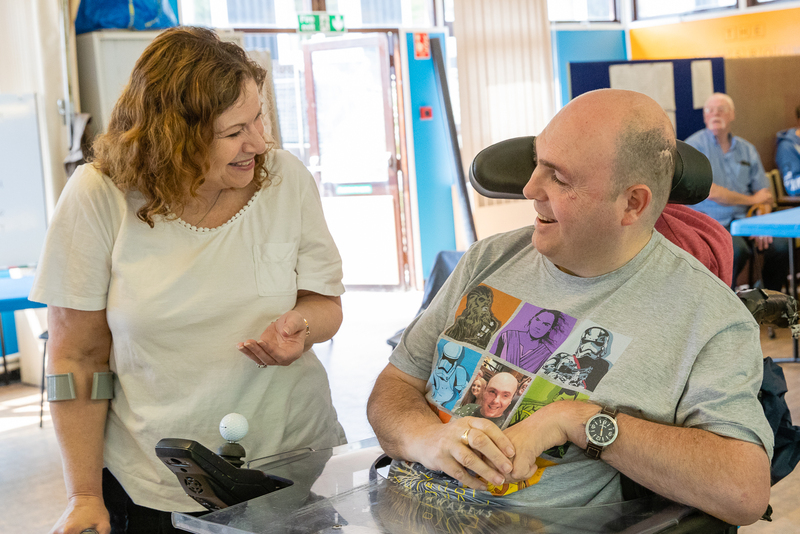 Sally started volunteering with Headway Cardiff and South East Wales 21 years ago, supporting brain injury survivors in their Independence and Wellbeing Centre. Staff were so impressed with her work she was invited to join the Board of Trustees just a year later. Sally also set up a fundraising committee and was a volunteer member until three years ago, helping to raise over £150,000 in that time. Sadly, in 2004, Sally was diagnosed with breast cancer and was forced to give up her volunteering for a short time while she underwent chemotherapy and radiotherapy. Sally recovered, but after taking an anti-cancer drug for eight years, doctors discovered it had caused her to develop arthritis. She now uses a stick or a wheelchair, and can no longer do all of the things she used to while volunteering at the wellbeing centre. Despite her own periods of poor health, Sally has always been a loyal volunteer and staff through she was more than deserving of the Volunteer of the Year Award. Lucy Nott, of Headway Cardiff and South East Wales, said: “Sally always goes above and beyond but never expects anything in return. “She is kind, compassionate, generous and always up for a laugh. She brings energy and life into our centre and it shows in the service users she supports. “We cannot thank her enough for all that she has done for the charity, our service users and our staff. Sally will find out whether she will win the Volunteer of the Year Award sponsored by Anthony Gold Solicitors, at a glittering ceremony at The Dorchester Hotel, London, on Friday, 7 December. Awards for Achiever and Carer of the Year will also be presented, alongside the Stephen McAleese Outstanding Contribution to Headway Award.